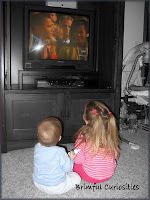 Even though my children are young, on January 20, 2009, they viewed the inauguration of President Barack Obama on TV. I took their picture as they, along with millions across the nation and world, watched him take the oath of office. President Obama's inauguration marked a major moment in our country's history, and I wanted them to be able to say that had witnessed the event. Despite one's political views, I imagine most anyone would agree that the campaigns, election and inauguration were history in the making. The New York Times recently released a new book specifically for young readers titled Obama: The Historic Journey: Young Reader's Edition . The book provides a wonderful overview for children ages 8-12 who are interested in learning all about President Barack Obama, his life, and the events surrounding the election and inauguration. Over 200 stunning, full color photographs accompany the age-appropriate text. Jill Abramson, the managing editor of The Times authored the book, drawing from articles and reports previously published in The Times. The exquisitely laid out and well-written compilation serves both as an informative work for children and collectible book meant to be treasured. 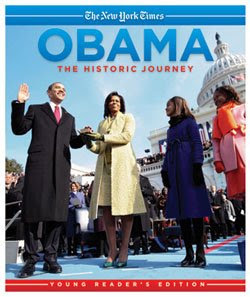 An adult version titled Obama: The Historic Journey is also available. I really like this impressive children's book that details Obama's journey. The artfully arranged photographs in the book alone make the book a worthwhile purchase and the text is informative without sounding overbearing. Quotes by President Obama are highlighted on a number of pages. I found the chapters covering Obama's childhood especially interesting. The mini-biographies on Obama, his mother, his father and his grandmother help illustrate how a seemingly ordinary person can rise above life's challenges and go on to become the president of the United States of America. Also included are Obama's family tree, a summary of both Obama's and McCain's campaign stands, a large electoral map showing final tallies, and a neat page spread listing fun facts about Barack Obama. Even the Saturday Night Live Palin skits are briefly mentioned. A plethora of children's books have been published on the topic of Obama. Obama: The Historic Journey: Young Reader's Edition , an excellent resource showcasing eye-catching photography, stands out from the rest. Thanks to MotherTalk, Penguin Group and Callaway Arts & Entertainment for this review opportunity!